It's not just that it's "difficult." It's not that it beats you down, over and over again, sometimes pushing you to the brink of frustration and frustration's cousin: rage quitting. Dark Souls II is enjoyable because you can overcome that. Because you can be better—tougher, wiser—than the challenges it throws your way. Imagine that: tougher than the toughest game out there. No achievement can stand up to that. 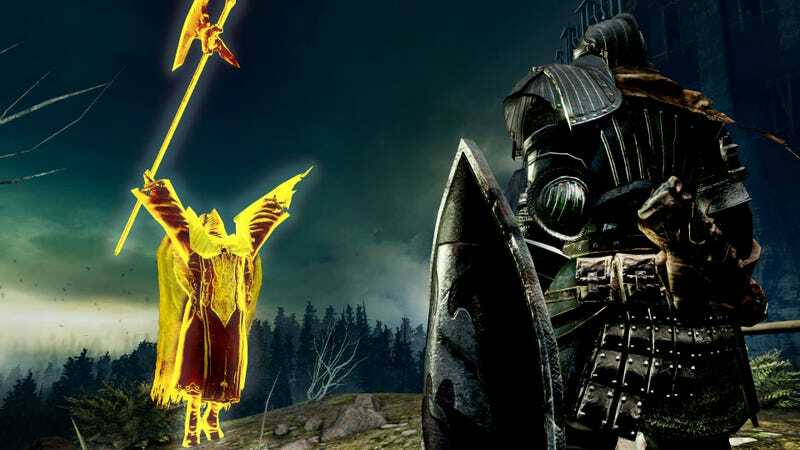 The Souls series is known by many qualities, but one in particular stands out amongst the rest: it's a hard game. And people love it for that. But can that be true? Do thousands of gamers clamor over the brutal RPG just because every enemy has more health than you, more resilience than you, can deal more damage than you? No one enjoys being treated unfairly, after all. But there's legitimate, old fashioned joy in Dark Souls, too. There's the joy of finally figuring out how to reliably set up cooperative play with a friend, a multiplayer feature that the game boasts to a degree—players can leave each other messages and shadows of their ghosts play out their deaths as warnings for dangers to come—but also intentionally makes difficult for you. You learn that the game will match you against people who have gathered a similar number of souls as you have, and that there are trinkets you can purchase to increase that matching range. So you buy a ring with a bunch of Gods' names on it and tell your friend to cycle to a name you picked at random. You tell them to hide their summon sign under a stack of barrels that you both break down to get to in the hopes that no one else is looking there. And then you tell them some other obscure, possibly dangerous location to drop their sign so other players stop summoning them, dammit. So the game presented you with a challenge. It told you, "This isn't going to be easy," but you were so determined that you found a way around every obstacle, a loophole for every rule. You solved the complex puzzle and, not only that, but you get to pass this information down to others. You get to watch as their eyes light up with this newfound knowledge, excited to go try it out at the next chance they get. What a feeling it is to be a Dark Souls II expert. I'm new to the Souls series. It always intimidated me, for a few reasons—mostly it was that I wasn't prepared for a game with such a drastic learning curve. Trial by error is one thing, but it's a whole other thing when the errors outnumber the victories by about 100000 to 1. I wasn't sure that I had that kind of time to spend on just one game. Plus, if this one was as difficult as they said it was, maybe I'd even enjoy the others games more than I could enjoy Dark Souls. But that's a past Tina. I don't recognize her anymore. And this is my theory as to why people love the series as much as they do, and why it's so fun: the victories taste that much sweeter when you know that not everyone has the stomach to pull it off. You killed that boss? You're 1 in 100000. What a feeling it is to be a Dark Souls II expert. Nowhere is my theory more relevant than in Dark Souls II's boss battles. They may be eyebrow-furrowingly difficult, but they're made—no, sculpted—that way. It's design with a purpose. On your first encounter with a new boss, you might just be learning its tricks. Ok, it slides like that. It jumps like this. When it makes that pose, it's about to fly up into the air and land on your head. So you better roll, roll, roll until you know you're safe. You learn its patterns and its movements. You learn to read its body language. You know when to approach and when to back off. You know how much to evade—does the situation require a tiny step back or do you need to roll out of the way?—and when to strike. Then you meet more complex bosses where you have to juggle both your understanding of their patterns and the level layout and whatever other new obstacles are thrown your way. Maybe there are regenerating enemies or switches you have to pull. It's a delicate balance, these boss battles, and you have to master the art of navigating them. And once you do defeat a boss—after multiple re-entries into the misty zone of their lairs and multiple nervous scramblings to recollect your dropped souls from the last failed attempt—it's such a victory. Maybe you'll strike a warcry victory pose to share in the glee of the moment with your phantom friends just before they disappear forever. Or you'll scurry around the now-quiet room that once housed the source of your heart palpitations, searching for chests and reading cheerful, almost relieved messages of "I did it!" and laughably ill-timed battle suggestions. All the while soaking in the hard-earned feeling of pride. Of knowing that, in the end, you were better than the beast. You were tougher, wiser than the meanest thing Dark Souls II could throw at you. If Dark Souls II is a hard game, I must be a skilled player. And, to a gamer, there are few better feelings than that.